Disclaimer: I will be offering a few of these for sale soon so this review may be biased. Again, I'm no expect in these things so here I'm just trying to give a few basic observations. I've also attached a few pictures at the end of the post. Unfortunately I couldn't take it further apart without desoldering a few joints, which I was reluctant to do. 1. Very compact. There's an attached picture below that shows how small it is compared to the 867. 2. Nice display with big and clear digits, with a nice orange backlight. 3. Excellent build quality, inside and out. Feels solid like a brick in the hand. Very tidy inside. There are a few jumper wires but I'm not too bothered. Besides, those are silicone insulated wire (i.e. high heat resistance) too! 4. Very accurate, based on my DMMcheck Plus and PentaRef anyway. The worst reading is only 0.065% out (spec'ed at 0.2%+3d tolerance). 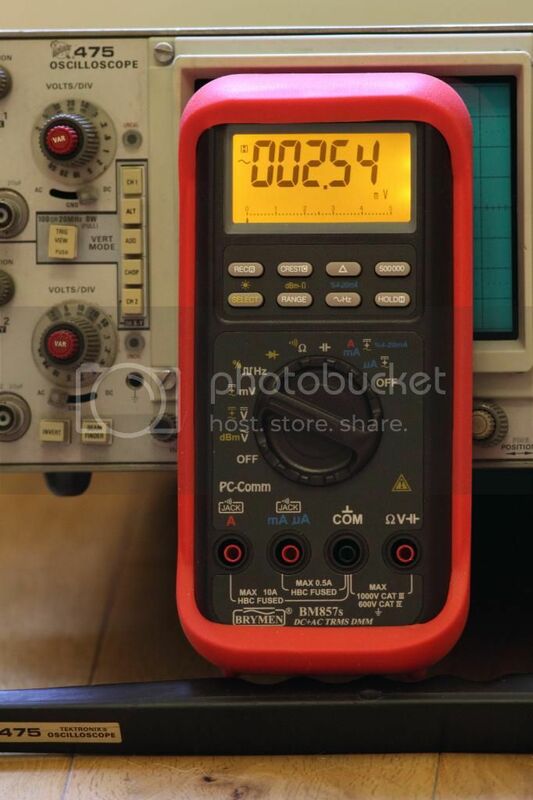 It reads 6.004V (right on the max of its 6000 count range) on my 6.0001V DC reference. All other DC voltages are either spot on or 1-2 digits out at the most. Resistance and current measurements are pretty much all spot on or 1 digit out, for its resolution. AC voltage is about 0.5% out, still well within its claimed 1%+5d tolerance. 5. Fast screen update rate at 5 times/sec on V and A ranges. Bar graph 40 times/sec max (according to manual). 6. "InErr" displayed with beeps when leads plugged into the current jacks with wrong range switch selection. 7. A or mA selected automatically based on which jack you put the plug in. 9. 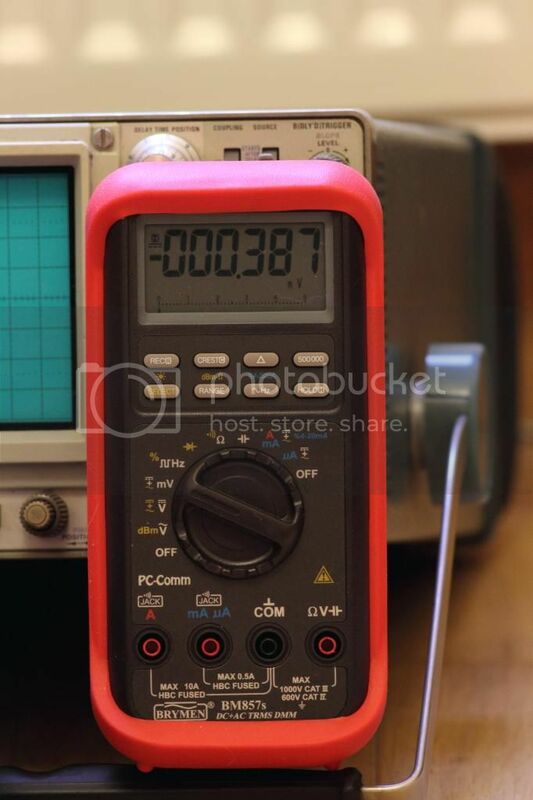 It remembers your last selection on multi-purpose ranges such as ohms/continuity/capacitance/diode, so the next time you turn the range switch there you are automatically back to your last measurement mode. 10. Offers a low input impedance voltage measurement mode. 11. Comes with a pair of very high quality silicone leads, with gold plated tips! 1. Slow screen update rate on the ohms range, only about 2 times/sec. 2. Autoranging is also on the slow side with resistance measurement. 3. Doesn't measure temperature without the temp probes. 4. Only measures temperature down to one degree resolution, no decimal places. 5. A bit pricey for a 6000 count meter (more on this below). 6. Enabling the PC data logging isn't the most intuitive, I had to read the manual to find out. The "HOLD" button needs to be pressed while the meter is being switched on. I have bought the optional USB interface kit too but didn't really spent much time playing with it yet so I can't make too many comments about it. All I can say is that it's rather straight forward to install and it works. One VERY nice thing I see on the software CD though, is that it actually carries all drivers and software for all the Brymen meters capable of data logging! Not only that, the coolest thing is that it also has PDF's of the communication protocols of all these meters, which means you can write your own software to talk to them if you need/want to! Overall I think there's a lot to like and not much to dislike about this meter. In terms of price, you can find this meter rebadged as the Greenlee DM-510A in the U.S., for about $135 from Amazon. In Europe tme.eu is selling them for 85 Euros (before VAT and shipping). How's the battery life on this one? I saw that it's using two AA batteries, which could be a big plus (if you have your meter on all the time) as they are much cheaper than the 9Vs. I just did a quick test. It draws less than 3mA in all ranges (not doing any measurements though) without the backlight. With the backlight on it's about 21mA. Wow, i'm loving those fuses and look at tha LEADS!!! Beautiful leads i'll say. So how much did it cost you? Hmmm, I see that common problem with meters, a fuse with a voltage rating lower than the meter CAT rating. I know it's slightly off-topic, but I was wondering if you happen to know whether the BM867 is resold in the US under a different name? The meter protection rating, against the users, is double insulation per IEC61010-1 2nd Ed., EN61010-1 2nd Ed., UL61010-1 2nd Ed. and CAN/CSA C22.2 No. 61010.1-0.92 to Category II 1000V, CAT III 600V and CAT IV 300V AC & DC. V: Category II 1000V, CAT III 600V and CAT IV 300V AC & DC. mAuA: Category III 500Vac and 300Vdc. A: Category III 600Vac and 300Vdc. The fuses (across the amps ranges) do match these claims. The CAT II 1000V/CAT III 600V/CAT IV 300V ratings are marked very clearly across COM and the V jack only, not the A jacks. Therefore I'd say that Brymen has been quite accurate with their safety claims (at least from what our eyes can see). As far as I know there's no BM-867 equivalent in the US, only the 869. It's the Greenlee DM-860A. There's also the DM-860A-C, which basically is the 860A plus a calibration cert. Are you sending one to Martin? Looks nice there. I would not call those bodge wires, more like production solution to a routing problem that allows high voltage and high current with good resolution and minimal voltage drop. I would if they were easier to get hold of He was talking about reviewing his 251, which is the little brother of this 257. I believe they should have near identical performance, apart from the added features in the 257. I agree with your comment about the wires. I shouldn't have referred to them as "jumper wires". I also got this meter some time ago (as I live in Europe I got it at TME in Poland). I love the way it's so small but still feature packed! Is it considered good construction or not? Many others DMMs hide traces to prevent short circuits and traces breakage. I would be very interested to hear the opinions of the forum on this! Yes, it's a good design decision in this case. It's how they are able to get the big HRC fuses and the high CAT rating into what is really quite a small meter. Brymen does not make junk. The BM257 (now BM257S) is built like the proverbial brick out house. I would not hessitate to recommend it to anyone. I now have three Brymen multimeters, and for a reason. Ha Ha Ha Ha , read opinions , Ignore ones eyes ......the irony ..
Well I tend to employ a Socratic knowledge of my limitations and would therefore welcome opinions of the members here. Clearly I am not the cleverest or most experienced here that I can call other members out with ridicule. Decided against the 257, the selector question and was pondering the header pins between boards(would they cause problems later?). I got the BM857A, well I ordered the 857A, but received the 857S! The news is (Might put a smile on Dave's face! ), they fixed the backlight, it is now very bright and orange the same as the 257! Had no time to test or check it really, and there are some marks around the jack socket as seen before in this thread. Guess I better check it out thoroughly! Yes please provide some pictures! I assumed that the 85X series was an old design and it would not be produced anymore. The 857 is also a two-board construction. Good to know the backlight has been sorted out. Brymen probably also upgraded the fuses to 1000V. Not as cute as the 257, but much better for electronics, if you don't mind the lack of a temperature function. I think it still is an older model, read about it here in a year old thread (or so?). The dual board thing, the 857 seems to have only controls on the smaller board, it looked like the 257 might have some measurement signal on those headers..meh, what do I know though!! Not the best of pics, but clear enough to see the damage to the input jacks. Hmm, now I can guess what is following this post! FWIW, you look on Brymen's site (here), the catalog is still listed, and it's NOT under the "Senior Products (Obsoleted! No longer available!)" section at the bottom of the page.